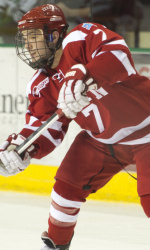 Terriers’ second semester woes continued as BU fell to Harvard, 7-4, in the Beanpot consolation game. BU took an early 2-0 lead on Mike Moran’s first career goal and a shorthander by captain Wade Megan. But the Crimson cut the lead in half almost immediately and knotted the score at two apiece just before the first period ended. BU regained the lead on an Evan Rodrigues power play goal, but it was downhill from there as Harvard scored four times to take a 6-3 lead. Cason Hohmann’s (photo) power play goal narrowed the deficit to two, midway through the third, but despite taking 19 shots in the period, BU could get no closer and a Harvard empty-netter closed out the scoring. The #3 Terriers also play a Beanpot consolation game, taking on Harvard this afternoon at Matthews Arena at 5 p.m.. The teams met in November at Walter Brown Arena, with BU edging the Crimson, 2-1,on goals by Louise Warren and Jennelle Kohanchuk.